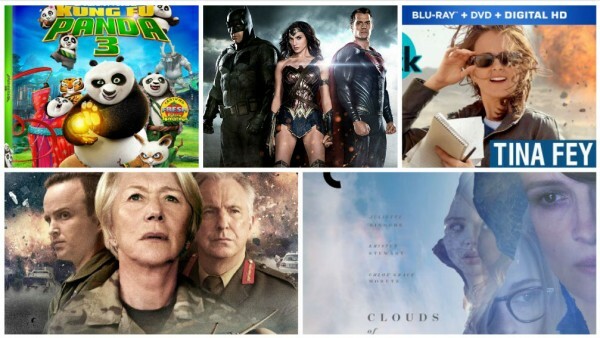 Want to know what’s releasing to home media this week? DreamWorks’ Kung Fu Panda 3 (already available in Digital HD) will be hitting stores on June 28th in a 2-disc Awesome Edition with Blu-ray, DVD, and Digital HD copies, as well as plenty of extras such as production featurettes, karaoke, and deleted scenes. Batman v Superman: Dawn Of Justice will release to Digital HD only this Tuesday (Blu-ray, DVD and On Demand at a later date) in both the theatrical and new Ultimate Edition that includes approximately 30 minutes of extended footage never before seen in theaters with a total run-time of 3 hours, 2 minutes. Criterion Collection is releasing the Oscar-nominated Stanley Kubrick film Dr. Strangelove, Or: How I Learned to Stop Worrying and Love the Bomb (1964), as well as Clouds of Sils Maria (2014) starring Juliette Binoche and Kristen Stewart, both to Blu-ray Disc this week. Other mentionable titles this week include the drama/thriller Eye in the Sky starring Helen Mirren and Alan Rickman, the much-promoted comedy/drama Whiskey Tango Foxtrot starring Tina Fey, and the comedy/horror film Return of the Killer Tomatoes starring Anthony Starke and George Clooney.